BUENOS AIRES, Argentina - President Donald Trump took his first step back in his months-long confrontation with China on Saturday, agreeing to cancel a planned Jan. 1 tariff increase on Chinese products in return for purchases of what the White House called a “very substantial” amount of American farm, energy and industrial goods. The limited bargain, reached with Chinese President Xi Jinping over dinner, will see the U.S. and China restart talks aimed at resolving a trade dispute that is damaging the global economy, worrying some of Trump’s Republican allies, and unnerving investors. But the partial accord recalled previous deals that administration officials have disparaged as unenforceable and unproductive. 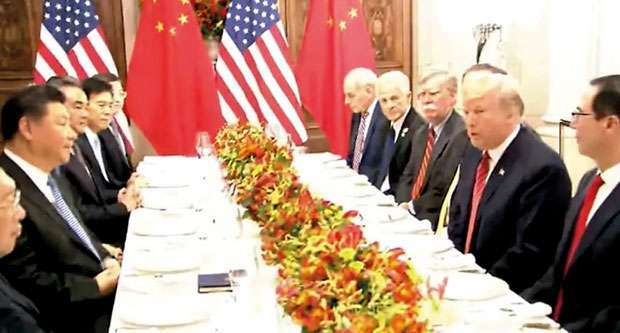 The two leaders struck the agreement during a roughly 2.5-hour dinner on the sidelines of the summit of G-20 leaders, personally tackling several of the greatest irritants in the U.S.-China relationship. “This was an amazing and productive meeting with unlimited possibilities for both the United States and China,” Trump said in a statement issued from Air Force One as he returned to Washington. “It is my great honor to be working with President Xi. Even as Trump appeared to soften his approach to China, he told reporters that he would formally terminate the 24-year-old North American Free Trade Agreement in a political gamble designed to force wavering lawmakers to back his replacement treaty dubbed the United States-Mexico-Canada Agreement, or USMCA.